Pots, Sandals and a Tent is a project made up of three art installations. These installations were designed by artist Kristiina Tuura as a part of Turku Europe’s cultural capital program in 2011. Pots installation is made up of 100 used pots and pans collected from refugee camps. Sandals installation consists of pairs of sandals and the paths created by them, which express their previous owners’ lengthy journeys. 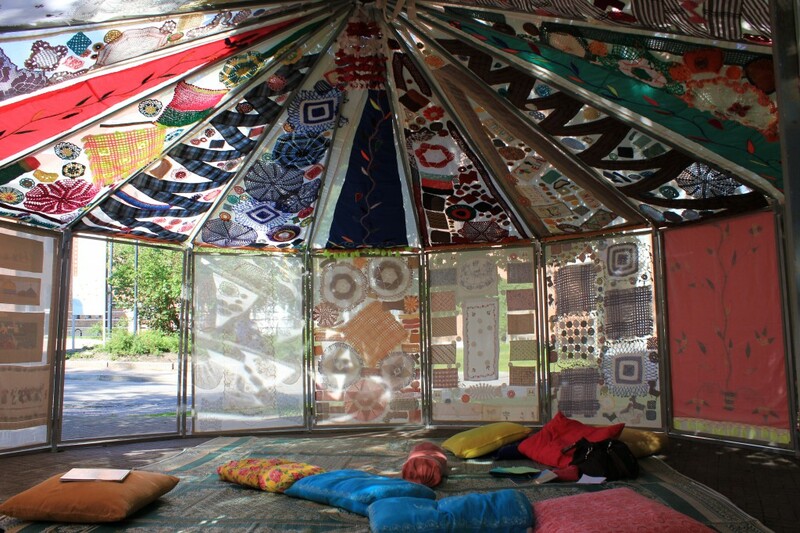 The Tent has over 800 pieces of crocheted and woven patches which were made by refugees all over the world in refugee camps and reception centers. The walls of the tent include table baskets made by girls from Kosovo, linen woven by Afghan mothers, chair covers done by Congolese mothers and canvas made by women from Sierra Leone. The handicrafts have been bought from women living in Asia, Africa, South and North America and Europe. In the context of the trade the stories of the women were collected and they were photographed. You can read these interviews here. The Tent was built into its final form with the help of inhabitants of the Pansio reception center. The aim of the Tent is to inform large audiences on refugeeism and issues involved with it through installation art and storytelling. The Tent has toured around Finland in various art centers and festivals, most recently at the Midnight Sun Film Festival in Sodankylä and the Helsinki African Film Festival. The Tent has been used for various purposes such as serving food, weaving, film screening, theatre performances and merely for relaxing. A documentary theatre performance directed by Ida-Lotta Backman has been produced in connection to the Tent. This performance is acted by two immigrant and refugee women. 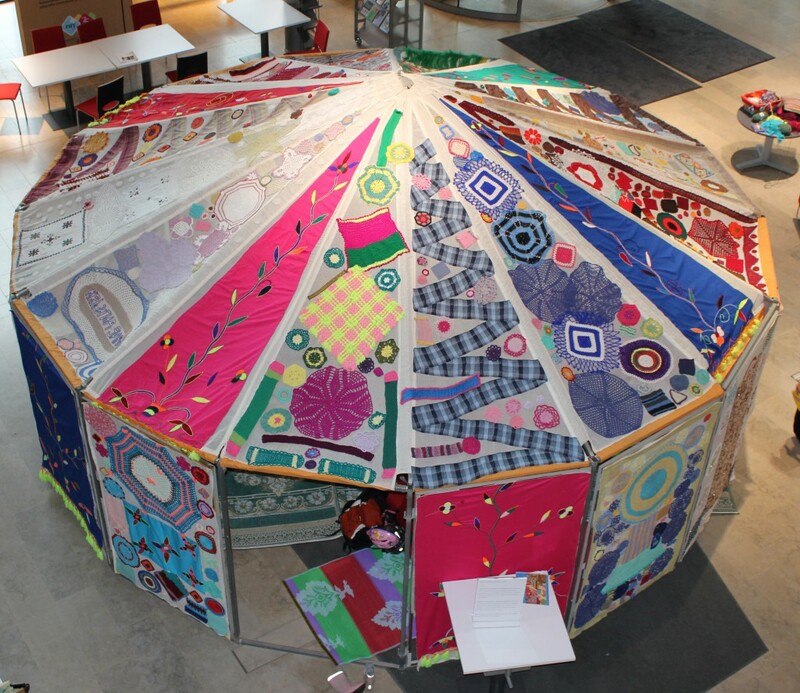 The performance brings together the handicrafts of the Tent and the life stories of their makers from each continent. There are two versions of the performance; an adult version of 45 minutes and a children’s version of 25 minutes. The Pots, Sandals and a Tent project has over the years been supported by the Ministry of Foreign Affairs of Finland, the Art’s Promotion Centre, Ministry of Education and Culture, Svenska kulturfonden, Turku culture capital city foundation and Kone Foundation.